The 10 Best Wedding Destinations in West Virginia! You won’t find a more perfect location to host your wedding than at one of the 10 best wedding destinations below. Whether you want to take your vows inside a beautiful historic building, outside at the edge of a peaceful lake, or high atop a cliff overlooking a wondrous natural landscape, you’ll find something that appeals to you and that will create memories to last a lifetime. Imagine the memories you’ll make standing at Serenity Point on Mountain Lake, taking your wedding vows with the one you love and surrounded by family and friends as the sun sets in the distance. Create an unforgettable experience at this Summersville, West Virginia, destination by enjoying the natural beauty around you and the breathtaking and peaceful scenery. This is one venue that will be everything you dreamed your special day could be. Built in the late 1880s as a wedding present for his bride, Berkeley Springs Castle in Berkeley Springs, West Virginia, offers a beautiful environment for your fairy tale wedding. Once a host location for glamourous parties and galas, the grounds include an arch bridge over a waterfall and many other scenes for great photographs. A wedding planner is available on site and can help with your special day arrangements. Your special day deserves special treatment and that’s exactly what you’ll get at Harman’s Luxury Log Cabins in Cabins, West Virginia. You can have an experienced wedding planner help you with the arrangements for your wedding and there are a number of packages to meet your desires and budget. Whether you say your vows high atop Seneca Rocks or on the deck overlooking the North Fork River, you can count on a day to remember. Your day should be done your way. You’ll be nestled in one of the most beautiful areas of West Virginia at Stonewall Resort in Roanoke, with 2,000 acres of mountains and fields that offer a charming nature-inspired theme for your wedding. Inside the resort with its rustic fireplace or lakeside at Stonewall Jackson Lake, services and receptions can be planned the way you want with the help of skilled wedding planners that take your event from ordinary to extraordinary. You can’t go wrong when everything is exactly what you want when you choose a wedding package that meets your dreams. The beautiful multi-story Patterson House can be the center of your event and house up to 10 guests. Additional houses are available for guests who choose to stay overnight. You can have an outdoor wedding on over 40 acres of natural beauty or an inside ceremony at the spacious barn that holds up to 200 guests. Party tent, tables, linens, chairs, dance floor, and stage are all included. Monongahela National Forest is the backdrop for this restored Victorian mansion called Graceland Inn and Conference Center in Elkins, West Virginia. The interior of the Inn features Queen Anne architecture with native hardwoods like quartered oak, maple, cherry, and walnut. There are guestrooms available for overnight wedding guests, and catering services that can be arranged based on suggestions provided by the catering coordinator or your own menu. A perfect place for your perfect day is what you’ll find at Brookedale Farms in Fort Ashby, West Virginia. Besides being a great place to bring the family for an outing, the helpful and accommodating staff at Brookedale will do their best to assist in making your wedding special. 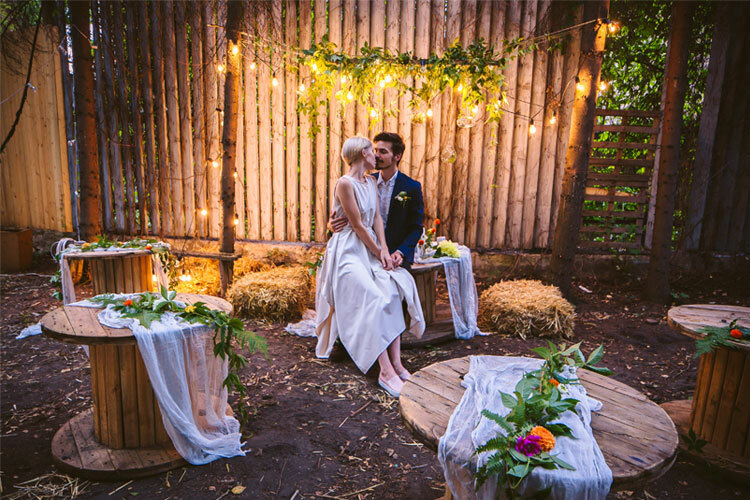 If you’re looking for a rustic down home country theme, the wedding barn can provide just that with the spacious room for the reception and large kitchen. The beautiful wooden stairs can be used as a lovely backdrop for photos, and catering services are available. Memorial Chapel at Rippling Waters is the perfect place to say your vows. Sitting right on the shore of White Swan Lake, the chapel is one of the most photographed chapels in the state. Perfectly situated, it provides a glorious backdrop day or night. Overnight lodging is available for a memorable and romantic honeymoon getaway. Blackwater Falls gets its name from the hemlock and spruce needles that fall into the waters and it is one of the most photographed locations in West Virginia. Blackwater Falls State Park has several gorgeous scenic overlooks on the 446 acres that are accessible all year, and there is lodging and other recreational activities available for those who stay overnight. The Smokehouse lodge restaurant has a great menu and can serve for banquets, wedding receptions, and other group meals.